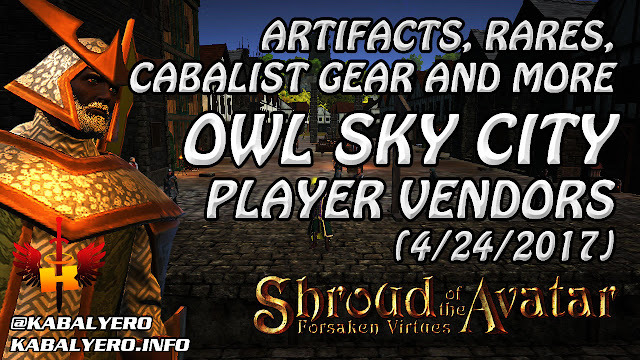 Owl Sky City, Artifacts, Rares, Cabalist & More (4/24/2017) 💰 Shroud Of The Avatar (Market Watch) - KABALYERO - PLAY, BLOG & EARN! Owl Sky City is a player owned town located just a little bit north of Owl's Head. I was there to update my player vendor and decided to check out all the player vendors in town. To see all the player vendors that I found in Owl Sky City, simply watch the YouTube video below.